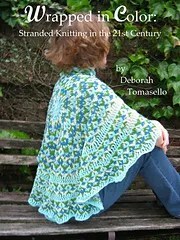 Today on the Yarnthing Podcast with Marly Bird: designer Deborah Tomasello of Colorworks by Debi! Deborah Tomasello, owner of Colorworks by Debi, started knitting when her Grandmother taught her to knit. In 2005, she took a how to make a sweater class and really got back into knitting. Her passion is colorwork, which she only learned how to do in 2009! She loved it so much it is now her life! Debi began designing in 2011 and already has hundreds of patterns available on her Ravelry page. Debi loves color and her patterns reflect that (I think color is the theme for this weeks podcasts). While she doesn’t do cables or purling, she is a master of stranded colorwork. In addition to her individual patterns, she has recently put out a book called Wrapped in Color: Stranded Knitting in the 21st Century. (Julie here, I think my favorite pattern is the Snowflake Shawl, technically correct snowflake geometry! Can you tell I am a geek?) The Amazon link for the physical book is here. Debi also has two other pattern collections available on Ravelry: Four-Stranded Knitting-It’s Easier Than You Think and Stranded for Christmas. Marly and Debi also talked about self-publishing and how Debi needs her feet to knit (really interesting). See below for a video of Debi knitting with her feet and the podcast player to listen to the podcast if you missed it! You can find Debi on: her website PatchworksByDebi.com (currently under construction), Ravelry, and Facebook. And we can’t forget about the Giveaway!! Leave a comment below with Debi’s keyword included for your chance to win this weeks prize! Debi knows that there is color, color e everywhere that brings smiles, joy, beauty to our lives and our knitting. I was amazed to see Debi uses her feet to work her color magic! She is a super hero in my book! I loved listening to Debi and learning about knitting with color….I would love to try it for 2014, thank you! Great podcast and amazing to see Debi using her feet for the colour knitting in the little video! As Winter passes us by its time to get into Color and her patterns do just that… They can brighten the most drab days! Impressive color work, on my to do list for 2014. Love Debi’s book Wrapped in Color and anxious to knit something from it soon! What an inspiring episode. I’ve tried color work before but it seemed tedious. But Debi makes it look easy and fun. I think I”ll give it another try. I am happy to say that I have really enjoyed the options Deborah’s patterns give me. I tend to pick a very colorful yarn and a solid…and watch what happens! I have double knitted her patterns and changed the gauge to use worsted weight yarn. My family has been wearing her patterns, my projects, for a few years now….and we all love color…. ColorworksbyDebi!! Very interesting video. It was nice to see how she does her color work. I never would have thought of using my toes to help me knit. Now that’s thinking outside the box. I have got to try some color work! Thanks for another fascinating podcast! Loved the podcast. Great background info, lots of color (although I spell that ‘colour’ normally) combined in great ways on the patterns discussed. Interesting info on putting out an e-book, too, as that seems to be more and more the way to go. Such an interesting interview. her color work designs have been inspirational and I’ve enjoyed all her comments regarding color and stranding and how she got into it. Such a amazing lady! Great interview with Debi. Color can make or break a pattern. There are so many beautiful colors that its hard sometimes to pick one. Great interview. I can’t wait to check out the video of Debi using her feet to do colorwork. Her passion for color and colorwork was evident throughout the interview. Loved looking at her designs on Ravelry. I’m finally doing a project using stranded color, so far, so good. I have just started to dabble in stranded color and I LOVE it. What a great podcast! I know there are many ways to knit, but I never thought I’d see someone tensioning a different color (or 2) of yarn in each foot. I always learn something new on the Yarn Thing podcast! Well, what a great idea to use your feet to add more color! Very creative! Thanks for an interesting interview and a great podcast!